Early boats were designated K1 to K6. The initial K was chosen to designate Kaschper, the manufacturer of the shells. In 1999, Robinson Crew replaced the initial letter with R for Robinson, followed by a letter for a 4-boat, or a number (odd for women, even for men) for an 8-boat. Shells are also marked with a distinctive color to aid recognition of the shell, its oars & other accessories. Robinson Crew used other shells before those listed on this page, but the names of these boats are lost to history. Most of these older shells were wooden hull models, which the team purchased used from other schools. Robinson Crew later sold these wooden hulled boats, and many are now in service inspiring men and women when they gather in halls and establishments to celebrate racing and other pursuits. In the early days of Robinson Crew, the team earned a reputation for innovation. In those days, the team used a double-hulled barge, made from two older wooden shells bolted together with a deck suspended between the hulls. Coaches plied the deck, giving directions to the 16 lucky novices positioned in the barge. The barge was retired after the 1994 season. A name is given to a shell to give it an identity and inspire the crew. The name is chosen to acknowledge an achievement, honor a person or commemorate an event. The name should have a lasting meaning to the Crew. Shells belong to the Robinson Crew Boosters Club (RCBC). The RCBC Board of Directors must approve all shell names before the name is placed on the shell. Rowers may nonimate a name for a boat. Team captains shall submit the nomination in writing to the RCBC with a justification for the proposed name. Team Captains are responsible for obtaining consensus of the team. Renaming of shells is permitted with strong justification and only on an extremely limited basis. Renaming a shell that has a person’s name on it should be avoided. If a shell is sold, the new owner has discretion of giving it a new name. 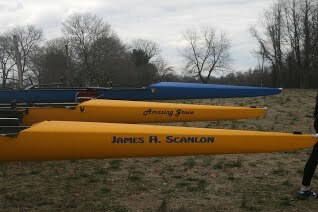 RCBC follows the U.S. Rowing size standards for all names and advertising on shell hulls. This standard limits a name’s height to 6 cm (about 2-1/2 inches); length is not limited. Sign-A-Rama in Fairfax City has made names for RCBC. The typeface name used is Hobo Bold. The vinyl color used is Royal Blue. The first letter of each word measures 2 1/2 inches tall, and the remaining letters of each word are 2 inches tall. All letters are printed in upper case, example: ROBINSON. First version probably written January 1894. Final version written October 1910, and published November 1911.